HERNDON, VA--(Marketwired - Jan 21, 2014) - Airbus Group, Inc. has delivered the 16th HC-144A Ocean Sentry maritime patrol aircraft to the U.S. Coast Guard. The Ocean Sentry is based on the Airbus CN235 tactical airlifter, more than 235 of which are currently in operation by 29 countries. This is the first of three HC-144A's planned for delivery this year. The latest aircraft will join a fleet of 15 Ocean Sentries performing roles from Coast Guard Air Stations in Cape Cod, Mass., Mobile, Ala., and Miami, Fla. The Coast Guard is planning in 2014 to stand up the fourth HC-144A air station in Corpus Christi, Texas. 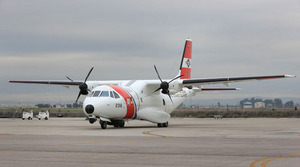 "The Coast Guard competitively selected and is buying the HC-144A because it has proven to effectively and efficiently perform the broad range of demanding maritime patrol missions, including search and rescue, homeland security, disaster response and national defense," said Sean O'Keefe, Chairman and CEO of Airbus Group, Inc.
"The Department of Homeland Security recently recognized the Coast Guard's HC-144A maritime patrol aircraft program as the DHS Project of the Year, and we're proud to have worked with them to deliver this capability consistently on schedule and on cost. We are pleased to be members of the Coast Guard aviation community and to support the dedicated men and women who protect our nation's coasts and waterways," said O'Keefe. The HC-144A achieved initial operational capability with the Coast Guard in 2008. Airbus Group, Inc., formerly EADS North America, is the U.S.-based operation of Airbus Group, a global leader in aerospace, defense, space and related services. Airbus Group contributes more than $14 billion to the U.S. economy annually and supports over 225,000 American jobs through its network of suppliers. Airbus Group, Inc., headquartered in Herndon, Va., offers a broad array of advanced solutions to meet U.S. military and commercial requirements, including fixed- and rotary-wing aircraft, homeland security systems, public safety communications, defense electronics and avionics, and threat detection systems. Airbus Group is a global leader in aerospace, defense and related services. In 2012, the Group -- comprising Airbus, Airbus Defense and Space, and Airbus Helicopters -- generated revenues of EUR 56.5 billion and employed a workforce of over 140,000. About this company Airbus Group, Inc.
Airbus Group, Inc. has delivered the 16th HC-144A Ocean Sentry maritime patrol aircraft to the U.S. Coast Guard. The Ocean Sentry is based on the Airbus CN235 tactical airlifter, more than 235 of which are currently in operation by 29 countries. This is the first of three HC-144A’s planned for delivery this year.